I wasn’t sure I was going to write about Jose Reyes. I thought about just letting this day go by without weighing in, without dwelling on it, and just try to focus on other things — fantasy football, bowl season, Christmas — in the hopes that I might miss any press conferences or introductions in order to lessen the impact. Then, before I knew it, it would be Opening Day and, so what? It’s like he wasn’t even here. But that, of course, is not possible. 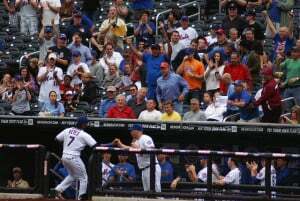 Reyes is arguably the most dynamic player the Mets have ever developed and he sure was fun to watch. He loves the game, he has fun, and his smile shows that. If he’s on your team, you can’t help but root for him. If he’s on the other team, you really want to beat him. And that’s what makes this new destination, in South Florida, all the more perplexing. A few years ago, when the Phillies and their fans complained about what they perceived as Reyes showboating, the Marlins also got in on that meme. (Ironically, if you google “Jose Reyes showboat,” you find a lot of Phillies blogs slamming him, particularly in ’08 — as well as several advocating that the team sign him this offseason.) I always felt the Marlins had no ground to stand on with that complaint, because Hanley Ramirez has never been known to put his head down and run out a double. And now they’ve gone and signed the guy they think has a little too much fun out there. I’m certainly torn between wishing Reyes well and hoping his contract becomes an albatross to the Marlins. I like the guy, and good for him for getting his payday. And the Mets, if Sandy Alderson is being truthful, made a competitive offer, which is all I could hope for out of this scenario. Well, yes, I hoped the Mets would re-sign the guy, but not at six guaranteed years and something north of $100 million. I think their alleged offer of five years in the $90 million range, with a sixth-year option to push it over $100 million, was a competitive offer. But Reyes clearly wanted the guaranteed money — and potential to reach the playoffs. Yes, let’s be honest here, the Mets are looking like the worst team in the NL East for 2012, despite what looks to be a wide-open division. It’s too early to say who the favorite is, because a lot of player movement is still to come, but I can’t envision the Mets being better than any of the other four clubs. But does Reyes push the Marlins over the top? I’m not so sure. He’s averaged just 98 games the past three years, and his addition means franchise player Hanley Ramirez will have to move to third base. Good luck smoothing that one over, Ozzie Guillen. The club’s ace, Josh Johnson, didn’t pitch after May 16 this past season, and despite all the Phillies’ other holes, the front of their rotation is still solid, so the Marlins can’t match that. I will say this, though: For once, the expectations of the Marlins’ ownership may be justified, for the first time since about 2003. They’ve set the bar too high in recent years and run off a couple of good managers as a result of inflated hopes. But as I said, it’s early. These Marlins are looking to spend like hedge-fund managers during the Bush years. They may add more important pieces, which would change the outlook. But building a team through free agency rarely works. Teams tend to have better track records with a successful core that is then supplemented by free-agent pieces to fill the holes. The Marlins’ holes are more than a shortstop — and not even that — and a closer. I could be wrong. Time will tell. These are just the initial thoughts and feelings not even 24 hours after a guy we’ve come to love watching out there left for a team only a mother could love. We didn’t talk about this last night – I saw the official word on FB and all I could do was sigh. Though I was steeled for the inevitable announcement, I’m bummed anyway. How many games will I want to see next year when the most compelling thing at the ballpark is a Shackburger? Yeah, I wasn’t much into talking about it last night. Or at all, really. It is what it is.